Oilers Entertainment Group CEO Bob Nicholson announced Thursday the organization has partnered with WME | IMG and Professional Bull Riders (PBR) to bring pro bull-riding to Rogers Place starting in 2017. Nicholson confirmed a three-day PBR event will anchor a 10-day “western lifestyle festival” in Edmonton that will align with Farmfair International and include hockey games and other live entertainment. 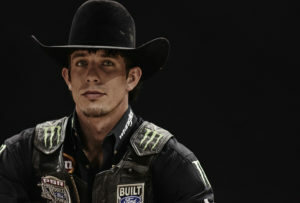 J.B. Mauney, Professional Bull Rider. Photo Courtesy of PBR/Cass Bird. Gleason said he sees Edmonton becoming PBR’s primary Canadian hub, just as Las Vegas is central to the PBR’s success in the United States, where TV ratings are up 33 per cent this year and attendance records are being set. Not only will WME | IMG assist in bringing PBR to Edmonton, Nicholson said OEG’s new partner will be a tremendous asset for attracting other events and opportunities to Edmonton. “They are a global sports, entertainment and fashion company and share our vision to bring new and exciting programming to Edmonton, centred on Rogers Place and ICE District,” he said. Stay tuned for more announcements surrounding the western lifestyle festival, in addition to other Rogers Place events, in the coming weeks. In a related announcement on Thursday, the City of Edmonton made the decision to not proceed with its bid for the 2017 Canadian Finals Rodeo. Nicholson said OEG will “keep the door open to rodeo” at Rogers Place, but there are no immediate plans. Photo Credit: COURTESY of PBR.